Morrison street eco house is a newly constructed, fully detached private garden guest house in a quiet, beautifully landscaped setting in a close-in to downtown neighborhood. Two bedrooms & master bath upstairs. Half bath downstairs. High end kitchen. One block to Belmont restaurants and shops and short walk to Laurelhurst Park & Hawthorne retail district. Ideal for singles/couples, business travelers, or small groups of families or friends. Suitable for families with non-crawling infants and/or children aged 3+. The eco house is a separate 800-squre foot home accessed through a courtyard garden alongside the main house. Light and airy and featuring reclaimed wood, the house is constructed for environmental sustainability and energy efficiency with exceptional indoor air quality. The house features oak floors throughout, low VOC finishes, wood windows, salvage fir trim and cabinets throughout. The house has two bedrooms and master bath upstairs and a half bath downstairs. The house has a high efficiency heating/cooling system for year-round comfort. The space has a full kitchen, with new stainless appliances and granite countertops. Tea and coffee beans are provided. Additional groceries can be purchased nearby at the neighborhood grocers: New Seasons Market and Hawthorne Fred Meyer. The living space has french doors that open out to the courtyard. A large dining table also provides a comfortable laptop work space to use with the dedicated guest wifi network. Summer guests can enjoy the cool of air conditioning unit. The bedrooms feature white oak floors, queen beds with brand new natural latex mattresses for comfort, health, and environmental sustainability. Super soft 100% cotton sheets are provided for your comfort. To maintain guest privacy and comfort, there shades on all windows. The master bathroom is adjacent to the bedrooms and has a full size tiled shower and large sink with ceramic countertop. The house also includes front load washer and dryer. There also is a half bath downstairs adjacent to the living room area. Feel free to enjoy the courtyard garden in front of the guest house, but know this is a shared area. Our family lives in the main house at the front of the property. We are available if guests need anything or have questions. The neighborhood is close-in SE Belmont/Hawthorne, just steps away from Belmont's restaurants and bars and a short walk from the Hawthorne district's shops, bars, theaters, and restaurants. Located close-in to downtown, the neighborhood is walkable to everything. Zipcars also are conveniently located a few blocks away and the bus stop for the 10 minute trip downtown is one block south. 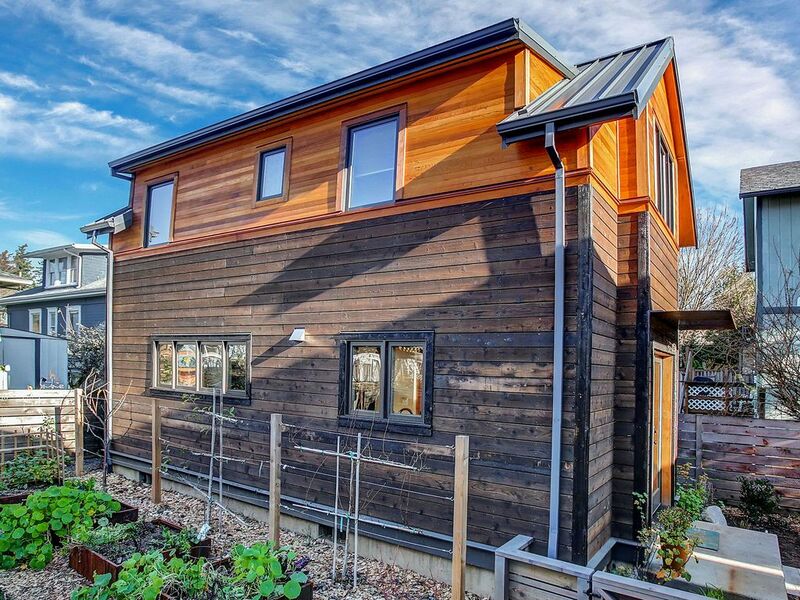 With construction completed year-end 2017, Morrison street eco house is in full legal compliance with the City of Portland, Bureau of Development Services building and permitting codes. We're a Portland family with three kids and two dogs. Dan runs a West Coast environmental nonprofit and Tami is a physical therapist, founder of an alternative health care practice, and an author. The kids are 17, 14, and ten. As for the dogs, Moka is a 6-year-old German shepherd and Timber (go Timbers!) is a 3-year-old French bulldog. The dogs reside entirely in the main house but you may catch a glimpse of Timber in the backyard. After nearly twenty years of living just a few blocks awayon this same street, we were inspired to buy and restore the main 1907 house a few years ago with the intention to also build the eco cottage as a quiet urban retreat for friends, family, and our VRBO guests. The cottage was in construction for more than a year and was completed in December 2017. We've restored several vintage houses and we brought all of that experience to this first new construction project with the goal of maximizing the ecological sustainability of the project and ensuring exceptional beauty of materials, natural light, and indoor air quality for our guests. We had a wonderful stay at this beautiful and well located space! A really cute unit. Kitchen and Dining Area light and comfortable. Checking in and out were a breeze. TV and video options worked well. I like the combination lock on the unit; very easy to use. Lack of parking was an inconvenience, especially in the rain, but our timing must have been good because when unloading/loading the car we were able to find a spot nearby. There were ants in the kitchen and upstairs bathroom, but the owner was aware and had set a trap in the kitchen. He was also quick to respond when I messaged him about it. This Southeast Portland cottage was perfect for our stay of two adults. The care, thought, and craftsmanship used in building this home shows. The downstairs area includes spacious ceiling height, a complete kitchen and dining space, and tv/hangout area. We had plenty of room to entertain ourselves and a small number of friends. Super-clean. Comfy sleeping spaces, and plenty of closets! The windows are perfectly placed to allow for light, and privacy. The location was convenient (within walking distance) to southeast Portland restaurants, coffee, and shopping. A cozy and peaceful spot for what turned out to be a snowy/rainy long weekend. Thank you!! We very much enjoyed our stay. The home is very clean, quiet and comfortable, in a very convenient location. We look forward to returning. We had an awesome time at your place. Will be back. Owners super helpful and responsive. Great location.